Episode 1 ran for 48 minutes. Every other episode ran for 24 minutes. One of the most annoying things about the anime industry is the seemingly ingrained belief that bandwagons, when jumped upon, have the mystical ability to carry studios into money. It's a sad fact that every season will undoubtedly see the release of one or more shows that clearly attempt to piggyback on the success of something that has gone before. Thankfully following trends isn't necessarily a bad thing, and every so often a series comes along that can be considered a superior example of its genre. Unfortunately that also means that the majority of titles that do jump on the bandwagon are mediocre at best. Originally a light novel series by Sugii Hikaru, Kamisama no Memochou (God's Memo Pad), tells the story of a socially awkward high school student, Fujishima Narumi, and his exploits with the NEET Investigation Firm (apparently "It's The Only NEET Thing To Do"). The story begins with a series of text messages that lead to a seemingly unrelated scene in a love hotel involving a school girl, a businessman, a delinquent of some sort, and an attempt at blackmail that ends with an ashtray to the head. Narumi, having recently moved to Tokyo, finds himself geographically challenged to the point where he's in a perfect position to see that same girl jump out of a window. After that things get a bit random. One of the major problems with Kamisama no Memochou is that the plot doesn't really have any particular goal or objective. The story is told in a series of short arcs that often have very little direct relation to each other, and while this does tie in to the idea of individual cases at an investigation firm, the lack of any real focus causes the narrative to meander before any conclusion can be reached. In addition to this there's a surprising degree of contrivance apparent in the development of the plot, and while it's true that certain events are necessary to implement the growth of particular characters, it's much more preferable to have such things implied, inferred or even insinuated. That said, there are some interesting threads woven into the plot that lay a good foundation upon which the story can be told, and if one is able to ignore the obvious prefabrication in the narrative then there is a degree of entertainment to be found. Which brings up the issue of the company that Alice runs. NEET simply means "Not in Employment, Education or Training", which is a roundabout way of saying that a person is not just unemployed, but also has no real intention of finding a job. Given this fact, how can a NEET Investigation Firm exist when the simple act of working means that a person is no longer a NEET? To many folks it may seem like nothing more than splitting hairs, but in actuality it's the most prominent example of the mentality behind the series (more on this in a bit). Because Kamisama no Memochou is set in the "real" world, there's a degree of mundanity to the artwork that is surprisingly well suited to the series. There's also little in the way of flamboyance where the characters are concerned, but while the design principle seems focused on normality, the series suffers from a certain tired old saw involving beauty and people who aren't very nice. On the plus side, the animation is pretty decent for the majority of the show, and is only really let down by some poorly incorporated CG or the odd repetition of particular sequences (there's one in the first episode - see if you can spot it). The series opens with a rather straightforward introduction to the main members of the cast, all to the tune of "Kawaru Mirai" by Choucho. On the other hand the main ending theme, "Asunaro" by Suzumura Kenichi, is set to a montage that focuses on Alice and Narumi, and features lots of tumbling negative words and rapid fire photos. In addition to this the first episode concludes with a a rather dizzying series of photographs and images against the backdrop of "Colorado Bulldog" by Mr. Big (and if you want to know who they are, google it or ask your older siblings or parents). As for the background music, while the tracks on offer are varied and atmospheric that doesn't mean that they're always necessary, and in truth several scenes would be better without any sort of accompaniment. When it comes to storytelling it's often the case that a relatively weak plot will be masked by philosophical or psychological discussions, and that's pretty much what happens here. The script has a tendency to get bogged down in semantics and there seems to be an almost desperate need to expound upon the reasons for every action taken. Thankfully the voice actors are a pretty decent bunch, and while there are occasions where the performances are a little too excitable or overbearing, for the most part each role is handled fairly well. One of the more interesting aspects of Kamisama no Memochou is the manner in which the characters interact with each other, especially the contrast between the established relationships and the manner in which Narumi's connections to everyone evolve over the course of the series. Now while this suggests some very good character development, sadly that's not the case as the story follows the old idea that drama leads to growth. As the main lead much of the focus tends to fall on Narumi, but aside from certain events that force him to take charge he doesn't actually change very much until the last few episodes. One could argue that his introspective monologues are symptomatic of his evolution, but in truth the conclusions he reaches aren't reflected by any substantial changes in his personality. Right up to the end of the series he remains a figure who seems ill at ease with his role, and this seems like a wasted opportunity to explore what could have been a very interesting character. The downside to this is the lack of attention given the rest of the cast, and there are a number of points that remain unanswered come the end of the show. Who is Alice? Why did she start a detective agency? How did the rest of the team gather? Not once does Kamisama no Memochou attempt to address these questions, and worse still, Narumi doesn't even ask them. Apparently his character is content to remain ignorant of things that anyone in his situation would naturally want to know. Which neatly brings us back to the mentality behind the series. Intelligence is a difficult thing to gauge when it comes to stories, and one of the common assumptions is that the reader or audience will be unable to understand the choices, motivations and actions of this or that person. Writers make an effort to counter this, and the usual response is to load the dialogue with lots of big words, philosophy, psychology, psuedo-science, and other highbrow musings. The problem is that they often become so enamoured with their own intelligence that they begin to lose sight of what's important, and elements begin to creep that really don't belong or should have been thought out properly. In the case of Kamisama no Memochou this manifests itself not just in the name of the company. One has to question the basic premise of a girl of indeterminate age (but probably around 12 or13 years old), with a mild Dokupe addiction living alone surrounded by high tech equipment. In addition to that one has to wonder why a show about detectives and mysteries would need an episode dedicated to fanservice or baseball. This series has the potential to good, if not great, but there are far too many occasions where it takes its cues from titles like Gosick, not the least of which is the inclusion of an eccentric loli detective and her well meaning, yet slightly bumbling "assistant". As with many other tales of mystery, there's an element of entertainment that stems mainly from the viewer trying to figure out who, what, why and how, but that's where the magic stops. Although there are occasions where the show is interesting, and sometimes a little charming, these are always overshadowed by one question - who is Alice?. The lack of any explanations about her places a burden on the narrative that remains throughout the series, and while the show tries to mysticise her character from time to time, this is nothing more than an attempt to stop the viewer asking unwanted questions ("it's magic so it doesn't need an explanation"). Kamisama no Memochou is, at best, an interesting mystery anime, but like so many other shows that are the product of jumping on the bandwagon, it relies too much on the success of titles like Gosick, and too little on what it could have been. Kamisama no Memochou is more than just a detective anime featuring not-really-NEETs and a loli mastermind. It's an anime that really takes the time and effort to create a realistic yet fantastic world and populate it with some of the most endearing characters in all of anime. The plots of each mystery is engrossing and exciting; the characters are not at all static, growing and changing as the anime moves forward. When it comes to good detective animes, this is about as close to perfection as you'll get. The story of KamiMemo is both cliche as well as original. The first episode starts off pretty predictably: ordinary high school boy accidentally encounters strange people/event, gets curious and ends up being involved in some way shape or form. Don't let this banal opening discourage you! The rest of the anime picks up the slack and really shows off the depth of this series. The Angel Fix case is truly a climax and arguably one of the most well-done story arcs in anime history. Even the filler episode is done with a planned beginning, middle, and end, as well as a key plot element that both initiates and resolves the conflict. If that's not good writing, then I don't know what is. The anime demonstrates an exceptional grasp of the concept "detective anime". "Detective" implies that the plot must contain a great deal of mystery, of assumption and deduction that should engage the audience, while "anime" means that this is, above all else, a show meant to entertain and impart something valuable to us viewers. KamiMemo balances between these two aspects by focusing more on the "how" of the mystery rather than the who, what, when, or where. While the actual truth may not be all that surprising, the process and methods that Alice and her gang employ to uncover the truth gives the anime the atmosphere of being "on the case", which makes the anime that much more enjoyable. KamiMemo doesn't have the best art I've seen, but then again I'm probably being spoiled by Oreimo. The art is very similar in style to TMoSH, which further deepens the similarity between the two anime (explanation in Characters section). Good artwork all around, no derpy, awkward angles, and characters are portrayed both distinctly and realistically. Emotions are very easy to read, and mood is well-portrayed through the colors. I originally found this anime because Kakenukeru Anison Medley I ended with an extremely long excerpt of Kawaru Mirai. Which happens to be an amazing OP; Choucho sings some of the best OPs out there, along with Kawada and Lia. The rest of the OST is filled with solid music overall. Notable mentions include Teddy, the haunting song played whenever Alice explains the harsh truth. I don't understand what the emphasis on NEETs where - Alice makes tons of cash from taking her cases. NEET detective is quite the awkward irony. Besides that point, the characters in KamiMemo are very well done - they immediately and easily reach beyond their given roles in the story. For example, Ayaka is supposed to be just a schoolfriend, but ultimately becomes such an integral part of the NEET squad that her tragic fall in the final arc really makes an impact on both the viewers and the characters. One of the unique points of the anime is that the protagonist, Narumi, is given the Kyon effect. The Kyon effect is given to a high school boy, either in their first or second year, who is perfectly normal yet manages to attract around him an array of weird and bizarre characters, many of whom are quite gifted or have surreal abilities. Through these people around him, the Kyon-effected boy is given a chance to break out of his normalcy and become something more than what he was before by the merits of his character and the power of his will. While it may sound overused (and it only does because Haruhi is ridiculously overreaching), the Kyon effect is in fact not commonly used because of its delicate nature and the mixed reactions that the community usually gives in return. Narumi plays the role perfectly, becoming a hero in his own right through the course of the anime. Instead of a pathetic character who only knows how to voice snark comments and play the tsukkomi, Narumi pushes himself to his own limits and does everything in his power to protect those he truly cares for. tl;dr KamiMemo does some seriously incredible things with its characters. I won't even begin to mention just how perfectly amazing Alice is as a beautiful balance between a tsundere 12 year old and a calculated professional detective. KamiMemo was one of those "love at first episode" animes for me. It immediately gained a spot on my Top-10 anime list, and Alice became my 5th favorite character in all of anime. I was honestly impressed by the dynamic nature of basically every character. Even Alice grows and matures through the course of the anime, though remaining true to her detective creed and ideals. Watching the anime was simply a blast. The first season of KamiMemo covers volumes 1-4 of the light novel series. With 4 more volumes still untouched, I sincerely hope that somewhere on Heaven's Memo Pad is an entry for a season 2. The word "NEET" is used almost interchangeably with "bum" and "hikikomori" in Japan. KamiMemo is about NEET detective Alice and her so-called assistant Narumi solving various cases in Tokyo with the help of three other NEETs and a Yakuza group. While the premise and the main characters are strikingly similar to that of Gosick, they are very different shows in that KamiMemo is more about the drama than mystery. The story is arc-based with at most two characters for every case. This ensured great character development for the featured characters, which is the driving force behind this series. Unlike your typical detective show, the cases are often simple. They're often very much solvable thanks to the abundance of hints planted throughout each arc. KamiMemo was far more engaging than Gosick to me as I found myself thinking about each incident with the characters rather than just watching a detective story presented to me. The downside of simple cases is that the story seems dull at times, though it makes up for it by adding drama and inspiration to the story. Despite being a detective anime, KamiMemo is filled with themes typically found in shounen (especially battle or sports) anime such as friendship, determination, justice/morality, belonging, search for a purpose in life, and love. There's also quite a bit of action, and like in the real life, many things are settled by brute force in the end rather than intelligence alone. The characters are rather stereotypical, but the anime spends a significant amount of time developing each person involved with each crime. Though Alice, Major, Hiro, and Tetsu were underdeveloped and functions almost exclusively as case solvers to advance the plot. The focus is on Narumi's growth as a person and clients of the NEET Investigation Firm. Their past, hopes, and desires are carefully presented to build up for the climaxes. While it can difficult to accept the corniness of Alice's speech and the convenience of the buildups at times, you are always rewarded with touching drama and inspiration by the end of each episode. The art and animation quality is absurdly high for a series of this type. Characters designs are very generic, but everything is detailed and maintains extraordinary consistency (even in a baseball filler episode). There are some sloppiness when characters are shown from distance, but this is only noticeable because of the amount of detail and fluidity in regular scenes. Overall, the visuals are far above par. OP/ED are very addictive songs that fit the show perfectly (I didn't even skip them!). Voicing is a perfect match for every character, and BGMs were decent. Episode 1 (double-length) was an original story specifically written for anime by the author of the novel, and in my opinion it was by far the best, most well thought out arc. I think this shows J.C. Staff's inability to properly pace and adapt novels. Everything was summarized pretty well in the final episode despite it being volume 1 out of 7 in the novels though. There were many instances where I felt the anime was saved by the inherent strength of its source material, but I found it to be very enjoyable overall. Kamisama no Memochou (God's Notebook) is one of the slightly darker "high school mystery" anime I have watched. It may not seem like it at first, but this anime is not as lighthearted as something like Hyouka. Hyouka doesn't have anything like suicide attempts, money stolen from the yakuza, or mind-altering drugs. The only real problem with the story of Kamisama no Memochou is it's slow and cliche start. The first four episodes are really nothing special, but after that, the latter two slightly longer arcs that make up the remaining 8 episodes are almost as good of mystery arcs as some of the Death Note arcs. The story follows Fujishima Narumi. At the beginning, Narumi's nothing more than your usual male protagonist who is somewhat forced into an uncomfortable situation (he seems and looks a lot like Ryugamine Mikado from Durarara at first). Narumi's father works abroad for all but around 5 days out of the year, so he lives with his older sister who works to support both of them. Because of this, he is forced to move around often, has changed schools many times over the years, and has become used to moving and avoids making many friends. One day, he is up on the roof of his current school in Tokyo when a girl named Ayaka sees him. She is the single member of the Gardening Club and is growing plants on the roof. After forcing Narumi to join the Gardening Club, she takes him to a ramen shop which is where she works occasionally and where a group of NEETs (people who are not employed, in education, or training) meet. Narumi is welcomed into the group despite stating that he is not a NEET and has no intention of becoming one. The three NEETs are all there because they are working for the NEET detective, Alice, who lives in a room above the ramen shop (which is her main supply of food as well). 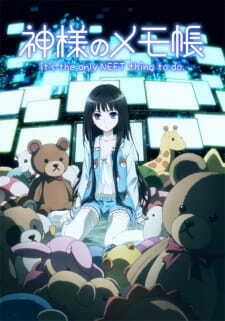 Alice is an introverted detective with incredible hacking and computer skills who loves stuffed animals and a soda called Dokupe (which is clearly not advertising for Dr. Pepper). From there, the group is involved in several cases (as I mentioned, the first few are a little boring). Eventually Narumi gets more involved with the group and becomes more of a leader who has the respect of the other NEETs and a gang who is closely tied to the group of NEETs. Trust me, if you don't completely hate the beginning of the show, don't give up on it before Episode 5. The story really picks up then and Narumi starts becoming a much more interesting character. Alice's room looks really great with the computer lighting and stuffed animals and the very final scene of the show looks spectacular, but other than that, the art is mostly average. It's set in a city, which is drawn well, but I think Durarara and Death Note (which have similar settings) have much better art. The character designs are also similar to other characters (I mentioned before Narumi looks like a copy of Mikado with brown hair instead of black). Alice is your typical "loli with long hair" female lead as far as looks go. About the only design that stands out is Hirasaka Renji's due to his odd, dyed blond bangs which make him look more like a Yugioh character than someone fitting in with the rest of these more normal looking characters. I actually really liked his design since it was so unique and interesting. There's no problems with the Japanese voice acting, but the soundtrack is a little strange. It's usually not even noticeable (with the OP and ED [I don't include them in the score] overshadowing almost everything). There are a few good tracks, but there is also one weird "song" which sounds like a woman saying some words in English with long pauses in between each word. There's not much other than that that I remember. I thought the characters at first were just a bunch of bland copy characters from other shows, but they really had some good development that changed my mind completely around 7 or 8 episodes in. I didn't think Alice ever really developed much, but she was interesting from the beginning so that's not really a problem. Narumi is definitely the most developed character in this show. Despite his whole reason for getting involved in this story being pretty cliche, he really does a good job and actually turns into a good leader. Several characters mention that he should become a con man, which I could see happening in his future if he wasn't so nice (though he has a nice breakdown later on). Hinamura Souichirou (Hina) is also an interesting character. He doesn't necessarily develop, but he has a really good role in the first "good" arc. Hina is a gang leader with an extremely loyal group of followers. He can be very intimidating and strong when he wants to, but he is also kindhearted and has a very interesting backstory. He works with Alice and the other NEETs a lot and forms a strange bond with Narumi. The other NEETs who help Alice are Tetsuo, who is skilled at boxing, Hitoshi, a skilled hacker who looks like an elementary school kid, and Hiroaki, a gigolo who uses his female connections as a wide source of information around the city. Along with them is Ayaka, who is only occasionally involved in the cases (the last one has a lot to do with her) and mostly just helps by working at the ramen shop and making sure Alice bathes. While this anime gets off to a very slow start, it really picks up around Episode 5 and becomes a good, fairly dark mystery anime. The characters become much better after that point and just the overall arcs and story becomes much more unique. While there isn't really any overarching plot aside from Narumi's development, it's just interesting to watch as the story progresses. Kamisama no Memochou does a good job of pulling you into the NEET detective world it sets up in Tokyo and connects you to the characters slowly throughout the 12 episodes. Some similar shows would be the more lighthearted Hyouka while Durarara and Death Note have similar settings and some similar characters (Alice and L are kind of similar detectives who spend most of their time inside). Shindere Shoujo to Kodoku na Shinigami is a manga with a similar balance of comedy, drama, and somewhat dark mystery. I would recommend this manga if you like mystery anime at all. It may start out slow, but it's rewarding to stick it out until it starts becoming more unique around halfway through.